55 million voters, 55 million citizens now susceptible to fraud and identity theft after a massive data breach that leaked the entire database of the Philippines’s Commission on Elections (COMELEC). With 55 million voters in the Philippine’s, this could go down as the largest government related data breach in history. The data dump comes just weeks before the May 9 election and right after a warning from Anonymous Philippines. 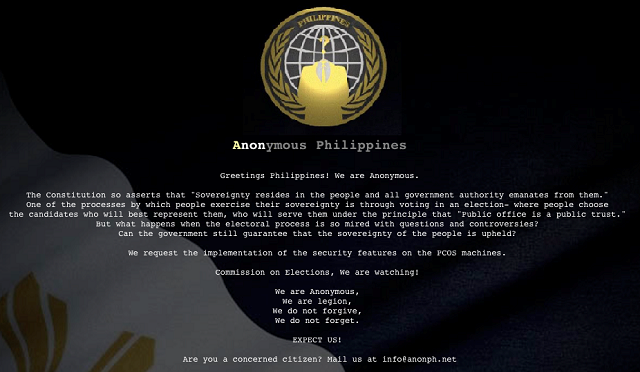 On March 27, the infamous hacktivist group warned COMELEC to tighten up their security on vote-counting machines, hacking into their website and posting the notice on the main page. While the actual breach appears to have come from Anonymous, it was a second hacking group, LulzSec Pilipinas, who actually posted the data dump online. Whether the hacking will affect the elections or not is a serious matter, but there is also still the great potential for misuse of all of the leaked voters’ information. This information is now at the mercy of cybercriminals who have a wide variety of extortion/blackmail attacks they can use with this data. Stolen data can be used to influence phishing attacks, give access to bank accounts and ultimately could lead to identity theft.